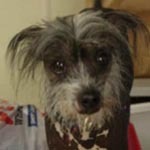 Diddy is a 2 year old purebred Chinese Crested who we recently rescued. He was raised with dogs and cats and teens. He is reserved at first, but soon becomes your best friend and he loves men. He is good on a leash and sleeps on a bed or in a crate, although he was not crated in his original home. He will bond quickly and closely. We're hoping for someone who can be with him for little walks during the day, or someone who has a dog walker. He's also very athletic and agile and loves to jump up in the air and can catch food in his mouth. He would be a shining star in agility. This is Adam. His Mom, Celia, and brother, Simon, were found together roaming around. We think they have had a hard life and not had a lot of love and attention. Mom Gracie is Labrador Retriever/Doberman/Hound mix. We are not sure about Dad, but he was some breed that can have blue eyes. 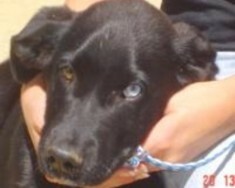 Adam has a sleek black coat and beautiful eyes - one blue and one brown. Those eyes are so striking and will beg you for love. He should weigh around 45 - 50 lbs when fully grown. He is 5 months old. 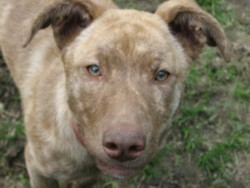 He is a shy dog and was frightened at the shelter he came from, so he will be in a foster home so he can blossom. If he inherited his Mom's disposition, he will be a super dog. His Mom is very sweet, gentle and affectionate. With love and a stable home, he will come out of his shell and prove to be a super companion. So far, his life has been one of survival and not much fun. It is time for him to enjoy life, get love and be well cared for. 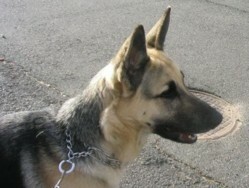 Angel is a three year old spayed female German Shepherd with Czech bloodlines. She was raised with a baby and a cat. She is lovely in the house, friendly, house trained, doesn't get into your stuff while you're at work. She loves balls and toys and plays, but knows when to stop. She's perfect! Angel will need a large breed or shepherd experienced owner, preferably with a fenced in yard as she likes to run and play. This adorable dog is Carmen. 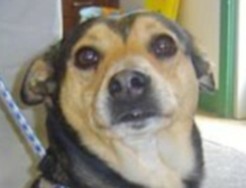 She is between 3 and 4 yrs old and is a Beagle/Manchester Terrier mix (at least that is our best guess). She is super cute with her big brown eyes. She is a good size - weighing between 25 and 30 lbs. Carmen is nice dog who is ready to bond. She is a bit timid and seems uncertain in how she will be treated. But she definitely wants attention and love, she's just unsure how to ask for that. She knows sit and walks well on the leash. She is a calm dog who will be well mannered. She gets along very well with the other dogs. She has no food issues and is tolerant. Carmen needs a stable home where she can grow in confidence and learn to trust. She is ready to give love and wants to be loved in return. With a little time, she will blossom and prove to be a great buddy. We are now accepting applications. Thank you! Meet Celia, a dog who has touched the hearts of the shelter staff from where she came. She is not as old as she may look. The graying that is around her face is also the same coloring on her feet. So we believe this is natural coloring and not a result of aging. We believe she is between 4 and 6 yrs old age. 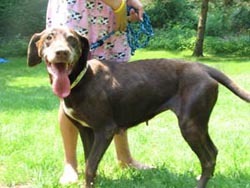 She is a Labrador Retriever who may be mixed with Hound or Doberman. 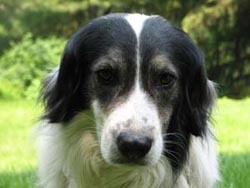 She has a reddish chocolate brown coat with white and gray markings. She weighs around 45 lbs, but needs to gain some weight. She came to a shelter we work with as a stray with two 5 months old puppies (Simon and Adam). We believe that she has probably had a hard life, but you would never know it from her disposition. She is has just a wonderful, gentle nature. She is super sweet and is well mannered. She loves attention and is ready to provide any one with lots of love. Her tail rarely stops wagging and she is always ready to greet anybody who comes to the shelter. She has no issues with food and nicely takes treats. She had no reaction to having her tail pulled or being pinched. She is attentive and is well mannered on the leash. Celia won the hearts of all the caretakers at the shelter where she came from with her personality. Please come meet her and give her a chance. She really deserves a home where she will be loved and cared for. We are now accepting applications. Please see our puppy adoption requirements before applying. Thank you! Dominic was adopted from a shelter 3 yrs. ago and now his owners are moving and can't take him with them so he got returned and then brought to Save A Dog. He's lost without his family. He slept with the teenage boy in the home every night. He's just past 4 yrs old and weighs between 40 and 45 pounds. He's housetrained and used to being walked twice a day. He is so handsome! Very calm and quiet dog that walks great on a lead. He goes right into his crate when you let him in. Sweet. 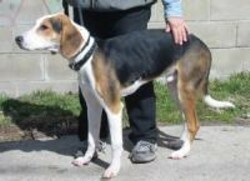 Max is a 10 month old neutered male Fox Hound who was originally turned in because he got too big for the apartment he was living in. We placed him with a retired couple and he had too much energy for them. We need to find the right situation for this nice dog. He is very responsive to training, but needs a fenced in back yard or a home with another dog (a female would be perfect) who would play with him, or even a job. He is up to date on vaccines, microchipped, and just an all around nice dog. His previous owners took him to training classes and he was very responsive. 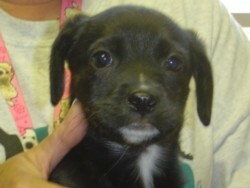 Mercedes is a female 8 week old puppy. She is too young to be spayed just yet. She and her sister Toyota are very sweet. 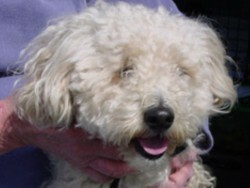 Papa Bear is a mini poodle who is 3 years old. He is a very sweet dog who became homeless when his owner became ill. He is supposed to be apricot, but he is very light buff in color. He loves people and gets along with other dogs just fine. He was not raised with kids, so perhaps a family with teens would suit him best. He is very gentle and low key. He will be neutered on 5/26/06. Just look at that face! Who can resist this adorable puppy. Ruby Red is a female puppy who appears to be around 15 weeks old. We first thought she was a cattle mix, then we thought a pit mix, but she just about doubled in size in a very short time and we started looking at the feet and realizing, oh no, she's a Great Dane. That would explain the brindled coat. Anyway, she is the best behaved pup we've had in awhile, completely housebroken and very laid back. She can be mouthy so small children wouldn't be ideal for her. She loves other dogs and is pretty good with cats too. She doesn't make a sound in her crate, is up to date on vaccines and is now spayed. She is blond merle with gold eyes, if you can imagine that. She is adorable and has a winsome personality. She is available by private appointment. 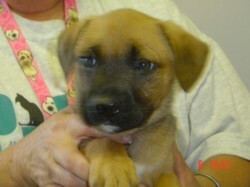 Toyota is a female 8 week old puppy. She is too young to be spayed just yet. She and her sister Mercedes are very sweet. They could have different fathers as Toyota looks to be mixed with something small like beagle or spaniel.